Animals – Coloring, Matching, Spelling & Learning Activities for Your Creative Baby or Toddler by Kandoobi is a creative app designed for toddlers and preschoolers. It is a 4-in-1 play and learning activity that encourages letter recognition, builds one’s creativity and imagination and allows users to manipulate and match animals from all types of environments. Come fly, swim, slither or walk in order to have some fun! Has your child “kandoobi” lately? Are you wondering what that even means? If so, then it’s time to meet the next educational app developers from Kandoobi. They are a development group designing apps so “kids can do” on their own or with the support of a parent. They recently released Kandoobi: Animals Edition for all Apple devices running iOS 4.3 or later. It is a creative application designed for toddlers and preschoolers. This target audience love to manipulate and explore. Well, now it is time to accomplish those two things as they encounter 100+ adorable animals all dolled up. For $2.99 and one simple download, users will get their hands on four interactive games. 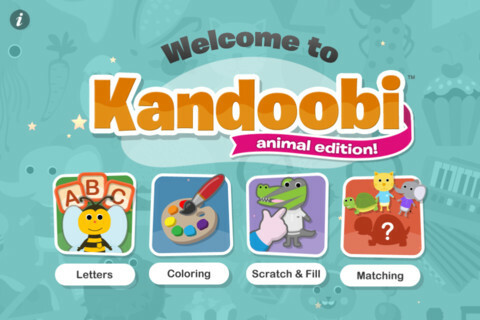 Whether you are playing at home, school or on the go, your child will soon be saying they “kando.” Kandoobi: Animal Edition encourages letter recognition, builds one’s creativity and imagination and allows users to manipulate and match animals from all types of environments. Come fly, swim, slither or walk in order to have some fun! Knowing the population that this educational app was designed for, developers have certainly created a very kid friendly navigation menu, intuitive tasks and buttons as directions are very short and sweet. Thanks to our friends at Fun Educational Apps for taking the time to have a little Kandoobi fun! Thank you for all of the reviews coming in for Kandoobi! We actually just got another awesome one in today from the kind folks at Best Apps for Kids. They did a fabulous comprehensive review on the app and even included video demos, what fun! Kandoobi Animals is the perfect toddler app! All four games include over 100 original, enticing and colorful animal, bug and reptile characters. The background music keeps kids moving and the narration is done by a young voice. All these things put together with great graphics and intuitive interactivity make this app a snap for our little ones to take off with! You can read the full review and watch the video demo here. Also, be sure to check out the “Meet the Developers” Q&A at the end of the article. We had a lot of fun answering their questions. And remember, we are always here for you if you have any questions or comments. Its a special treat when we get to interact with Kandoobi parents. As always, if you don’t have Kandoobi yet, you can get it on the App Store. We have been experiencing the most wonderful flurry of activity here at Kandoobi! With each day we get more and more amazing reviews. It warms our hearts to see all the kids having fun with the App. Below are a few snippets of our newest reviews! Be sure to click on the links to read the full articles. They are truly fabulous! I am always looking for stuff to entertain my kids while we are on the go. The kids get bored easily in the car or waiting at appointments and the easiest way to keep them occupied it to let them play games on my phone. I always have my phone with me, however I do not have many games that they enjoy playing. The Kandoobi Animals App is both a fun and learning app for the iPhone, iPad and iPod. The app features 100+ original, charming and colorful animal, bug and reptile characters that really keep my kids occupied! Creatures range from common animals like cows, chickens and cats to more exotic animals including aardvarks, blowfish, toucans and caterpillars! The Kandoobi Animal app is something that all of my kids can play with. The four activities offering learning and play options for children from 18 months to 5 years old, but my 7 year old has fun with Kandoobi just as much as my 3 and 5. I always buy toys that I know will last for years and now I have an app that will too! Check out the full review with photos on here! Kandoobi Animal Edition is a beautiful top-rated children’s game for the iPhone and iPad. It’s a 4-in-1 activity app that will surely keep your little toddler busy. With over 100 different characters to play with in each activity, this app offers a lot of variety that’s not usually found in young children’s apps. When you first load the app, you’re welcomed with a colorful screen filled with a fun musical tune. The four different activities to choose from appear as four big buttons across the screen. Keeping children entertained and distracted is easy with an iPhone or iPad, but better than that would be to also educate them at the same time. Kandoobi’s new Universal app Animals includes four different play-and-learning games that can teach your toddler new things while keeping them entertained. With 100+ animals to color or scratch-and-fill, shape matching, and drag-and-drop letter matching to spell animals names, your child will be entertained and educated all at the same time. Thanks to all that are reviewing and remember to keep sending us your feedback. We love hearing from you, keep ‘em coming! Wow, this Dad does his homework! His thorough review of the Kandoobi – Animal Edition iPad app will surely guide parents in their app selection. Great Kandoobi Review on Famigo! Kandoobi – Animal Edition got four out of five stars and a great review on Famigo.com.